For Emma Land, there was a time when living her Catholic faith was just a natural part of life. She grew up in a Catholic family, and attended a Catholic school for her first eight years of education. Then the changes and challenges came when she became a student at a public high school. Yet change has come again as the member of St. Patrick Parish in Terre Haute has become more involved in the youth group for the Terre Haute Deanery. 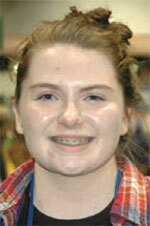 Coming to the National Catholic Youth Conference (NCYC) marked another step for Emma in her journey of faith.